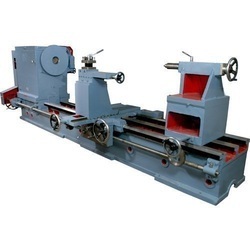 We offer Heavy Duty Lathe Machine of some of the most demanded brands in the market. These machines are best suited for heavy duty applications. The compact design and simple installation of these machines make the handling all the easier. The bed casting is made of close–grainded cast iron‚ well ground and finished. capable to withstand vibration free operation under heavy load‚ Bed is Flame Harden bed with cut grinding. Casting of Head stock is Graded and seasoned to avoid unevenity and effect of straine strength.